Normally when I read the morning paper, I don't bother to read the classified section. For some reason two days ago, I started glancing through it and found something catching my eye. A local person was divesting herself of all of her fibercraft accouterments including a small loom, a spinning wheel, and various yarns and equipment. Well, all that morning that ad nagged at me. By lunchtime I couldn't take it any longer and called the number listed. I made arrangements to view the collection after the seller got home from work that day. The loom was very old and in not-great-shape. Had she not wanted $400.00 for it I might have considered it and loved taking it apart, cleaning it, and trying to put it back together better than what I saw in front of me. It was a very old Harrisville 22-inch floor loom that might have been nice to use for placemats. But it was just too much money. Her yarn stash was admirable. It covered her couch as well as two or three chairs and contained a wonderful assortment of very artistic yarns. Tempting, but I have my own stash to work through. And so I moved on to the spinning wheel. I saw before me an earlier version of my Ashford Traditional spinning wheel. It was made probably late 60s or very early 70s, stained with a dark walnut finish, and very dusty. 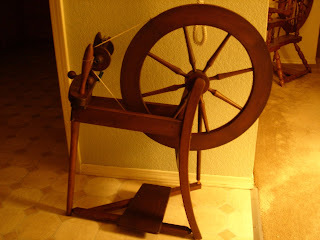 I tried the treadle and watched the actual wheel - it was a bit "off", not quite as true as my Ashford's wheel, but the driveband was not jumping off the wheel with use. I looked over it very closely then asked its owner THE question: "How much are you selling the wheel for?" At first she didn't mention a price, trying to talk about the wheel as if it was fresh off the line today. I pointed out the differences between her wheel and the new versions. I could see on her face that she realized that I knew my wheels. She then asked me, "Would $50 be OK?" Now I have a wheel to lend out to students or take with me to demonstrations to entice passers-by to sit and try. After bringing it home, cleaning it up and oiling it, it spins like a new wheel. It will have a definite place and job to do. And I am delighted to give it a good home. And here is a picture of Tina with my DH. I have been waiting for Tina to post about visiting Mr. Skittles (but she's been busy). Here's proof that he will actually accept cookies from total strangers! ;-) Actually, he really liked both Tina and John. We really enjoyed their visit with us and do hope they will visit again! 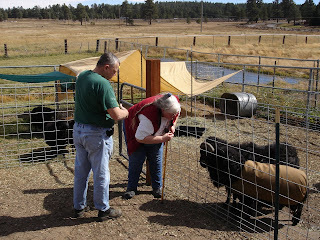 We even promised them to meet at Balck Sheep Gathering in '08. 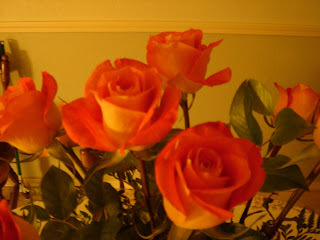 And last, but not in the very least...a picture of the flowers my DH sent to me on our anniversary. The pictures I took of them do not do them justice. He usually sends red roses, but when these were delivered he said that their color was so stunning when he was picking them out that he thought these were the better choice. Starting yesterday we have had winds of 60+ mph! The sheep were kept in the barn yesterday and today will have to be the same. The wind chill factor is terrible! Even with the wind blowing, I removed 1 inch thick ice from Skittles and Colin's water tank at 9 a.m.! And I darned near froze my nose trying to feed this morning. I felt like Marcell Marceau in his "Walking Against the Wind" bit trying to make it back to the house. Oi! More later...I need a hot cup of coffee and to get a fire going to keep the heater from running constantly. While feeding the sheep and making sure everyone was buttoned up for the night this evening, I heard a very familiar, albeit longtime-not-heard, sound coming from behind me. "Hmm, hmm, clack. Hmm, hmm, clack." It wasn't very loud. I think only someone who was familiar with the voice would have recognized it. As I slowly turned around I just had to smile. My old friend, Bran (pronounced "Brawn") was back! He disappeared just before I was to have surgery this past June. 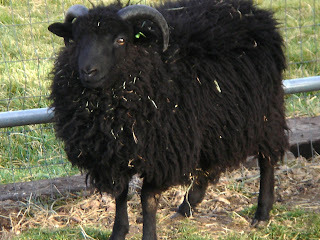 I would always ask my DH if he had seen him when he would come in from sheep and chicken chores. Nope. Not even a hint of a feather. He was gone all summer. 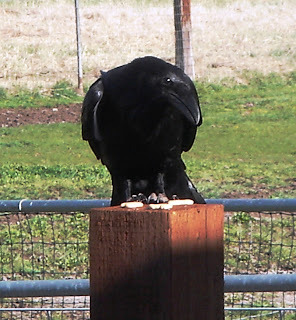 I suppose he was off doing Raven-things. He had brought both the Mrs. and the kids to see me shortly before he took off. I can only hope he and his family were "summering" somewhere nice. Were they on the beaches in the Virgin Islands? South America? Did he finally take them to Disneyland? I will have to ask my friend. Most likely he will not say a word about vacation, but instead ask if there have been any changes to the menu. Do I still serve animal cookies and eggs? What about the odd kitchen scrap? And are those freshly caught mice still on the menu? 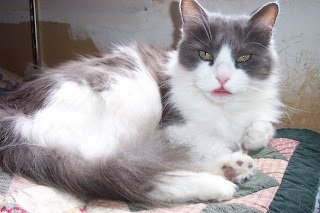 I will have to tell him that he'll have to discuss the mouse situation with Josie and Toadie. I'm glad to see my friend again. I stood for awhile by the gate, himself on the nearby post, trying to mimic his soft call to me back to him as we've always done. He seemed pleased that I would remember what to say. And as I placed a few animal cookies where he usually ate them, I noticed he had brought the Mrs. with him again. She just looked puzzled at the both of us, at our strange conversation we had going. They stayed close by until I went towards the house to come in for the evening. Goodnight, my friend. I am so glad to see you again! I'll see you in the morning...Winter hours now, Bran...let me have at least one cup of coffee before I have to come out and break ice. It's that time of year, isn't it? It's time here to put the garden to bed now that we've had killing frosts almost every night...time to watch the aspen leaves turning first gold, then brown, then flutter by in the breeze in order to make room for next year's leaves. So, too, it's time on the farm to see who stays, and who goes on to other herds of sheep. Above are the three ram lambs who are now ready to go on to flocks of their own. Well, all except Shaun who won't be for sale for a while. But Sheep Thrills Sven and Sheep Thrills Ole are more than ready to go! Yesterday when I was working around the barn I was witness to the game of "Head Butting" between the ram lambs. I don't know if it was the wind yesterday or the chage of weather in the air, or just boys being boys. Shaun would back up and run full throttle towards Sven, who was doing the same thing on the opposite side of their pen. They met in the middle with a thonk! that shook the ground and gave me a headache just watching them. This went on for a bit until Sven, who by now was a wee bit unsteady on his legs, backed off and let Shaun win for this day. I had dreams last night of finding Sven prostrate on the ground dead. Thank heavens it was only a dream. Apparently this demonstration of ramliness did not go unnoticed from their sire. Skit was rather upset with Shaun and the intensity of his attack against his half-brothers as he would bang his head on their pen fencing in what I could only attribute as anger at the roughness in the boys demeaner. I stood there, just thinking to myself but saying to no one in particular, "Too much testosterone." if it were easy, everyone would be doing it. I tried moving some empty feed bags in the barn when I saw them...the first tell-tale signs I again had unwelcome visitors in the barn. Mice. The first hint of cold weather here and we get mice heading into the barn for warmth and food. Drat! Now, we have all sorts of nasty things in this area: West Nile Virus, Africanized bees, assorted snakes, and Hanta Virus carried by the likes of the vermin trying to live in my barn. At the first signs of their presence I verbally post a Declaration of War on them. It has begun and I'm out for blood. Yesterday, I went into town to run errands and while I was there, picked up new traps to set for the mice. Last evening, I baited the traps and set them in areas I thought I had seen the little buggers in. Voila! This morning I had caught five of the wee beasties. Before I transported said DMBs (Dead Mouse Bodies) to the back fence line, I noticed Nosey Josie keeping a close watch to see if I would drop any. As you may recall, Josey is the Speckled Sussex hen I have with a taste for occasional oddity in her diet. So I offered her one of the mice. This time, she just looked at me as if to ask, "What? You want me to eat a BIG one? No way! I like the small ones." Shadow says, "Raspberries! Just invite them inside here, Mom...we'll take care of them for you!"